Playstation 3, Playstation 4, XBox 360, Logitech F710, and Logitech F310 game controllers are supported. 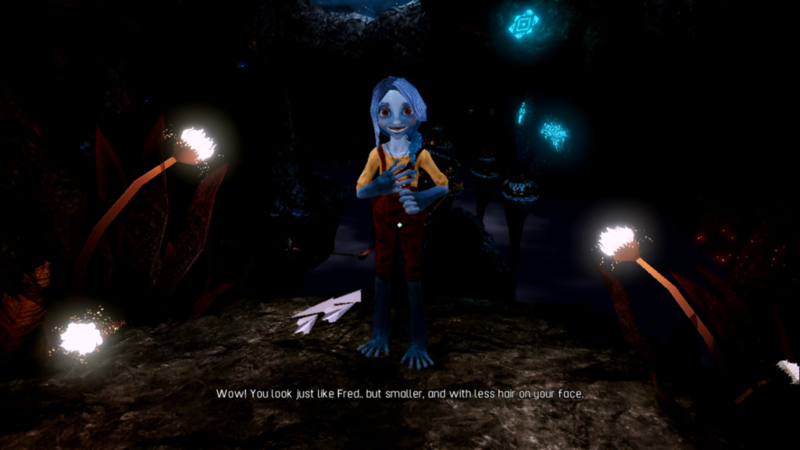 Figment is an action adventure game with puzzles, released in 2017. It was developed and published by Bedtime Digital Games. 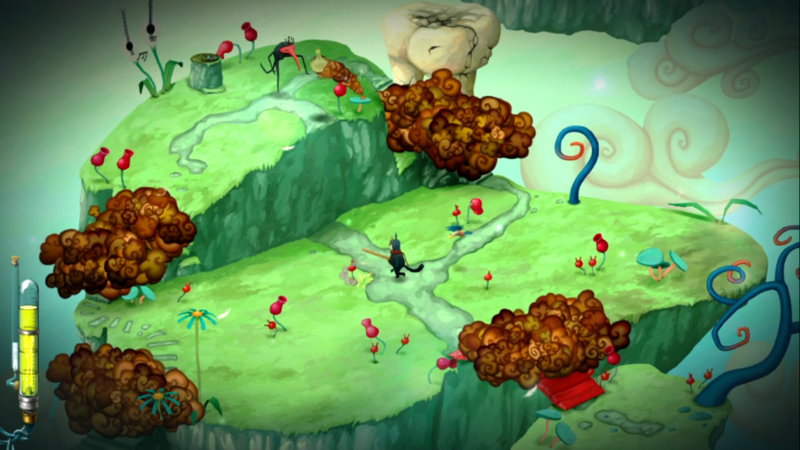 In Figment you play as Dusty who is on an epic quest to restore the health of the mind he inhabits. Figment begins with a family in a car driving through a stormy night. It sounds like a daughter in the back of the car is taunting her dad while he’s trying to focus on the road. Then out of nowhere the father yells, “Oh crap!” foreshadowing the impending crash that takes place immediately thereafter. After the crash scene fades out, another scene fades in where Piper, a friendly flying companion, comes to wake Dusty up and get him ready. It seems Dusty is a protector and adventurer that has gotten rusty with disuse. He holds on to his scrapbook, likely filled with memories of adventures past, and is preparing to make himself an intoxicating beverage to enjoy. While Dusty is away collecting ice for his beverage, a nightmare comes to steal his scrapbook. He begins to wake up to the fact that things are not all right with the mind, as Piper had been trying to tell him. Dusty then begins his quest to get his scrapbook back. Consume Endurance Neurons to replenish health. I’m not doing appropriate justice by my description of the narrative. Playing Figment made me realistically feel and experience emotions that few games ever have. With many games I sympathize with the characters as they make their way through the story, but with Figment the voice acting and body language of the characters combined with the musical score stirred serious empathy within me. Collect Endorphins to level up your hit points. My wife’s aunt suffered a terrible car wreck a few years ago that left her with a traumatic brain injury. For many months after the accident it was frustrating to sit by her bed side and see her reliving nightmares and grasping at incomplete overwhelming thoughts while we could do little to help. 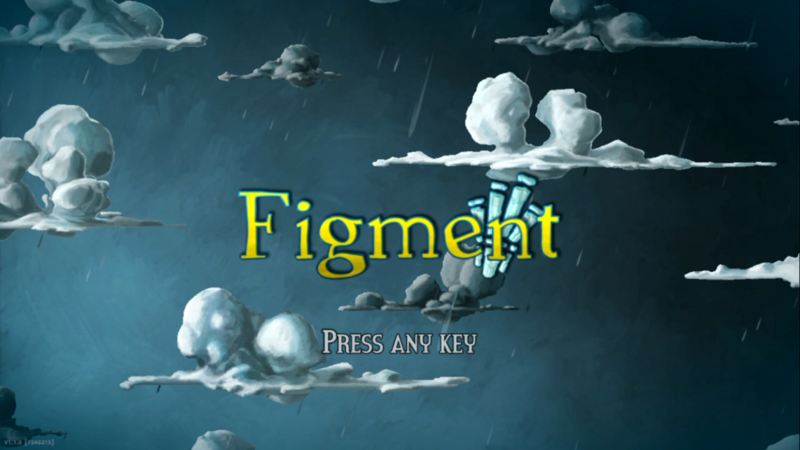 Figment puts you right there inside a mind, struggling for survival, and makes you feel determined to set things right. The combat is typical hack and slash. Dusty has a life bar, and he can take only so many hits before he must respawn at the nearest checkpoint. 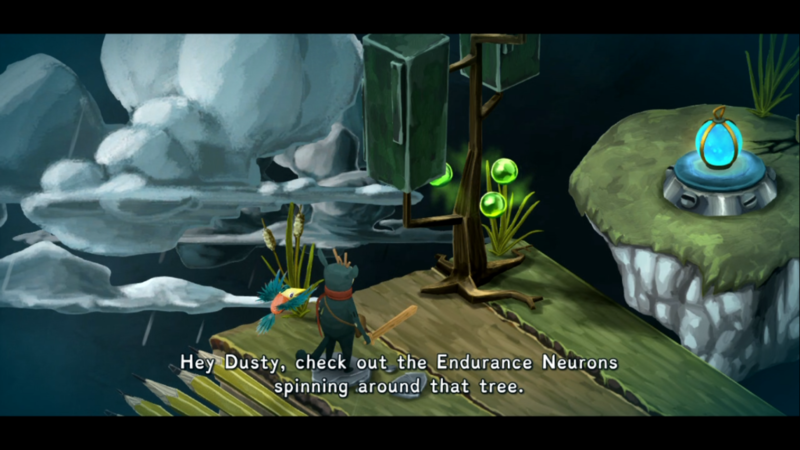 The life bar may be replenished using Endurance Neurons, green glowing balls that spin around trees throughout Figment’s game world. Picking up enough Endorphins will extend your life bar, providing you an extra hit point. Dusty must fight some diseased creatures like these Barf Rodents here. Dusty and Piper travel together through the mind to fight fear and sickness, stoke creativity, and recontain the nightmares into their proper place. As they journey they find memories they can use to piece together and recollect the person of the mind they inhabit. Dusty starts off as an uncaring jerk, but as he picks up more endorphins he begins to turn back into his former heroic self. When I finished recording my first impressions play through, my wife asked me if I had fun playing. I sat for a second and thought about it and then answered honestly, no. 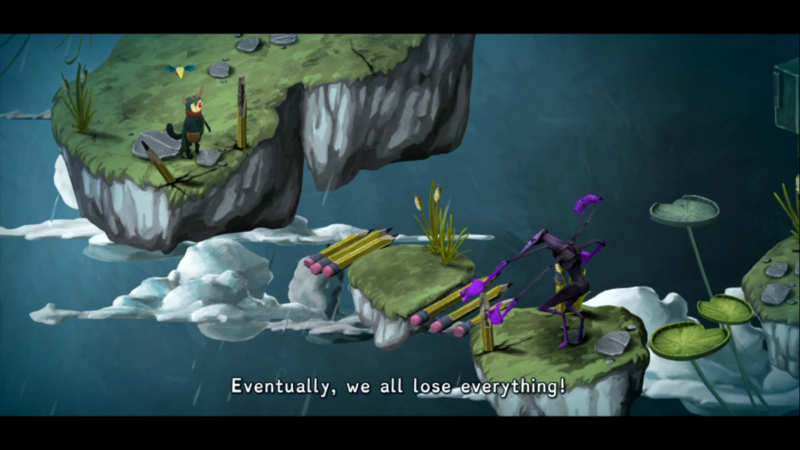 Thus far Figment has been a dramatic, poetic, artistic, incredible game steeped in symbolism, but not really fun. I plan to continue playing Figment till I complete it. There seems to be so much depth to the story that I want to see how it turns out. The character development, musical score, and vivid artistry combine to make an epic such that it feels I have a duty to see the story through to its conclusion. While it may not be “fun,” there’s no game that has grabbed so much of my attention lately as Figment has. In many ways Figment goes beyond fun to provide a moving experience very unique from any other game I have played thus far. Splasher is a two-dimensional puzzle platformer released in 2017. It was developed by Splashteam and published by Playdius. Gameplay reminds me greatly of Jazz Jackrabbit 2 and Super Meat Boy. 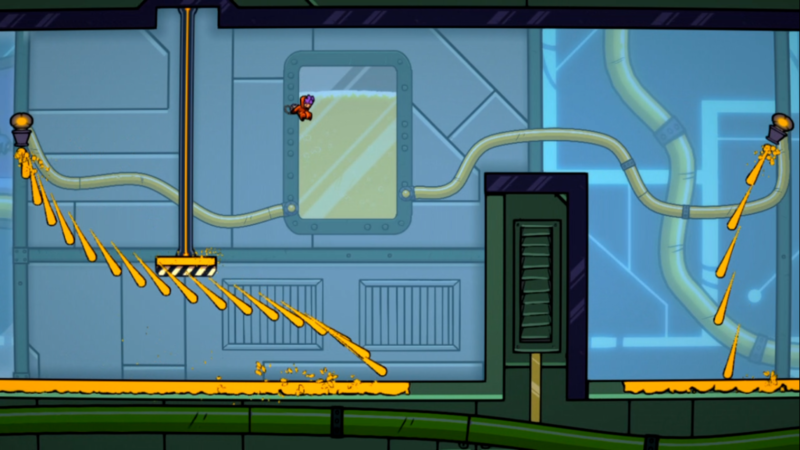 Splasher begins with your main purple-haired character scrubbing the floors at Ink Corp – very similar to the plot of Oddworld: Abe’s Oddysee. While he’s cleaning he happens to peer into a room where experiments are being done. Inside the room a mad doctor is injecting one of his fellow cleaning technicians with a substance that turns them into a potato. Scared by the scenario unfolding in front of them, your main character understandably gets the heck out of there and level one begins. Red Ink is sticky and provides gravity. 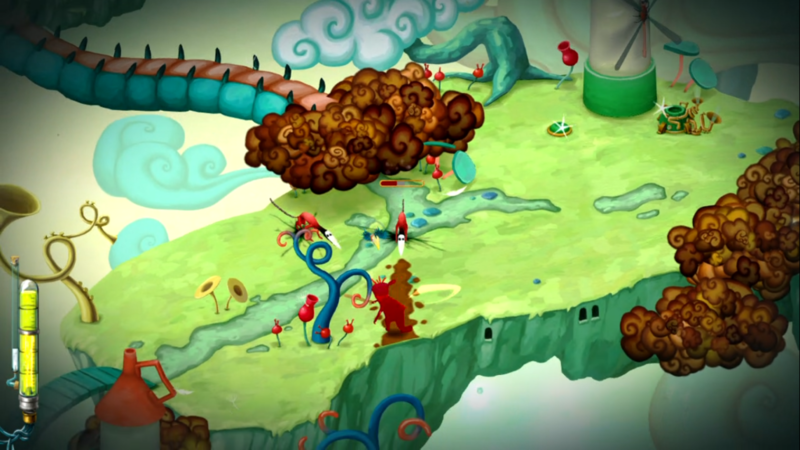 The first level introduces the controls and serves as a basic tutorial on how to play the game. Splasher is the kind of platformer where you have great control in moving your character mid-flight. The character moves fast and the platforms and character seem small in comparison to other platformers I have played. This made the controls take a little getting used to. 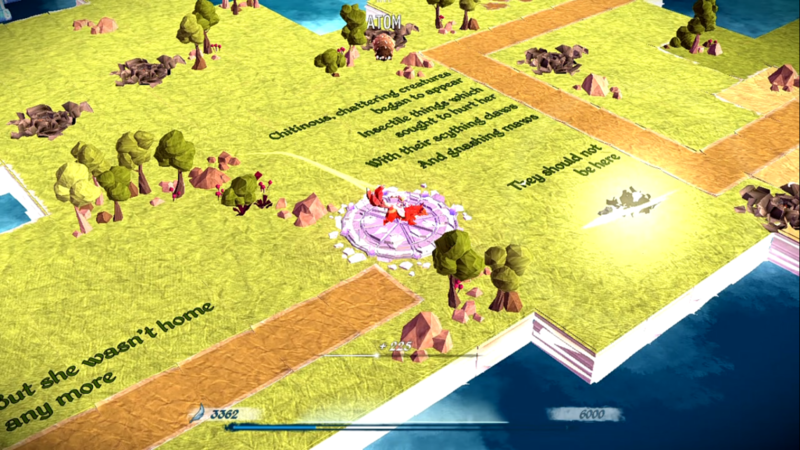 After completing the first level, the player is transported to an overworld map where they may enter the next level or go back and replay a previous level. It is possible to do a speed run on previously played levels to beat your previous time. 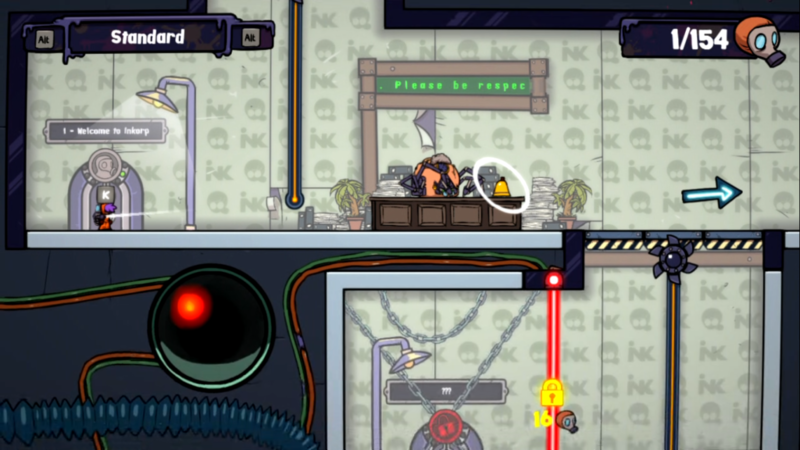 By examining the speed run mechanic, it appears there are 22 levels in Splasher. Yellow Ink makes you hop. Through the first three levels that I have played, I have been able to deduce that there are two types of ink. Red ink sticks you to the surface it’s on and provides gravity for you to walk across when on a ceiling or wall. Yellow ink makes you bounce around like you’re dancing with flubber on your feet. Water can be used to clean ink off of surfaces. The player first receives a water gun. 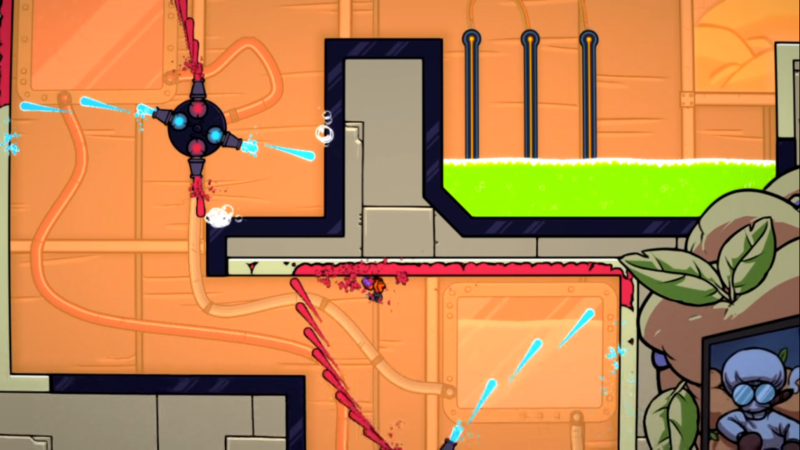 Eventually it appears the player receives the ability to shoot red and yellow ink from their gun, but I was not able to unlock this ability within the first three levels. Shooting potato creatures with water makes them explode and helps the player progress. Get 700 yellow to free a friend. 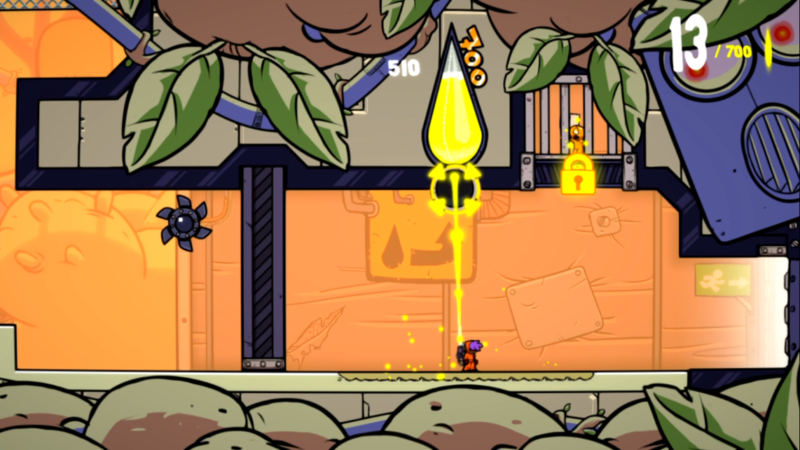 The player receives a yellow substance from eliminating enemies from the game. If you can accumulate 700 units of the yellow stuff you can free your comrade locked in the cage at the end of the level. Similar to Oddworld: Abe’s Oddysee, you can rescue or “accidentally” kill fellow Ink Corp employees as you are working your way through each level. The specialty Splasher brings to gaming is its fast paced puzzles that must be solved for the player to progress. 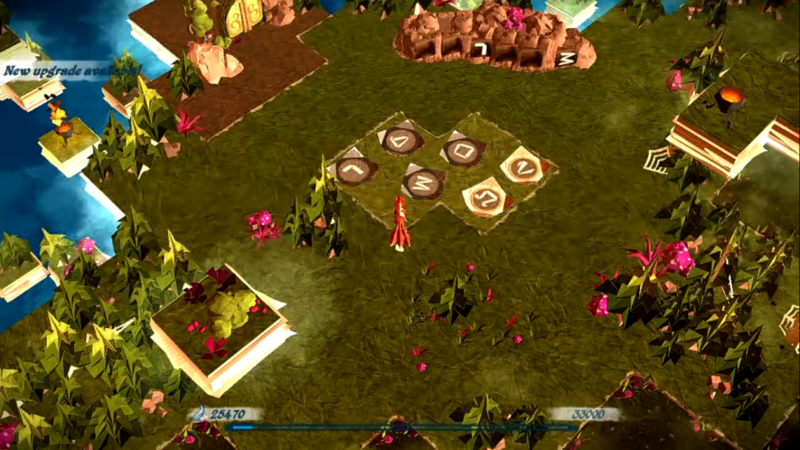 Checkpoints are available between each puzzle within a level so the player isn’t forced too far back when they fail. However, it is clear the greatest satisfaction Splasher offers is in getting good enough to jump from puzzle to puzzle completing the level in the shortest time possible while achieving the greatest score. 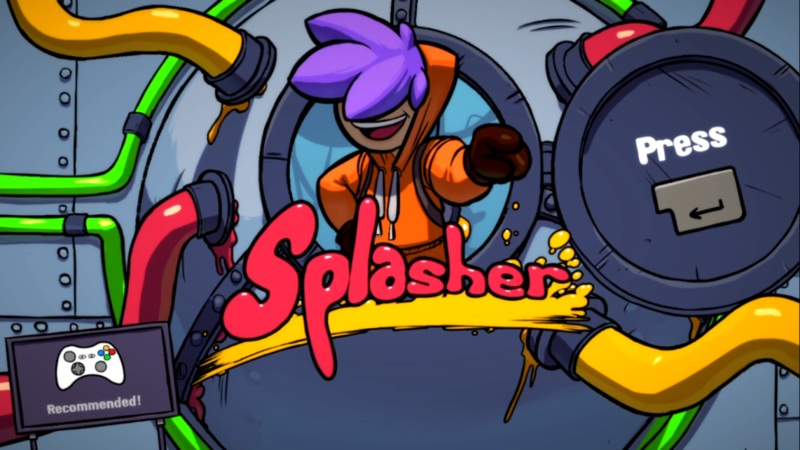 Splasher appears to be a decent game for puzzle platformer speed run enthusiasts who enjoy a challenge and love competing against their past scores. Given that Splasher is a single player game, I am surprised I didn’t encounter an online leader board so individual players may see where they rank in worldwide rankings. It feels ridiculous for me to continue trying to beat my own score, but working my way up a rank and knowing I am Xth out of Y players worldwide pushes me to keep trying to get better. When I was a little kid, around four to six years old, my grandparents would take me with their friends on big vacations to other states. One time we went to Pennsylvania, another time it was Vermont. We would tour the Liberty Bell or Ben and Jerry’s Ice Cream factory during the day and then at night they would try to put my sisters and I to bed and then break out their Rummikub set. If I were quiet enough, they would let me sneak in and watch the game. One time I asked what a smiley-faced tile was (it was a joker) which got me instantly marched back to bed. I learned quickly to keep my mouth shut about what was in my grandpa’s hand. My grandparents had a Rummikub set that looked like a padded briefcase. 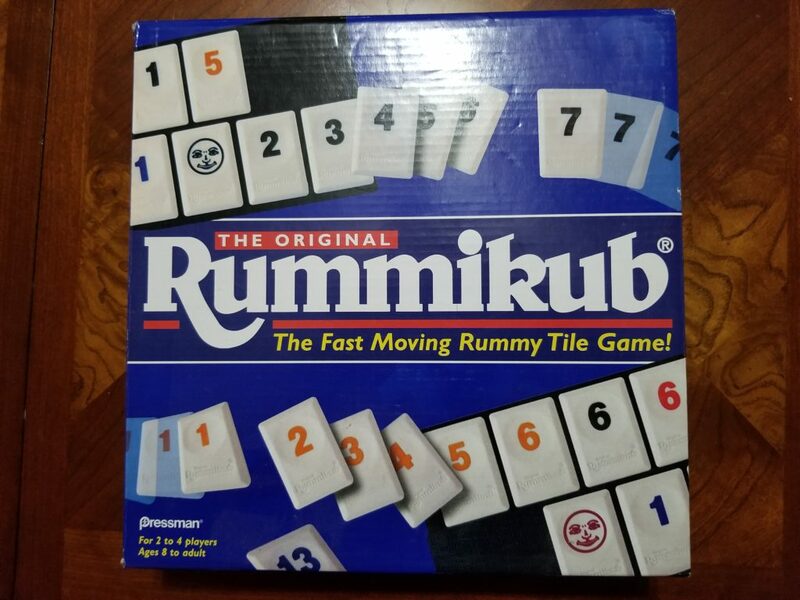 On the side of it was a fancy label that said Tournament Rummikub. The tiles felt fine and exotic though the boards to hold the tiles felt a little flimsy. My grandpa is now deceased and my grandmother has dementia. The last game she remembers how to play is Rummikub, so we play it with her every chance we get. 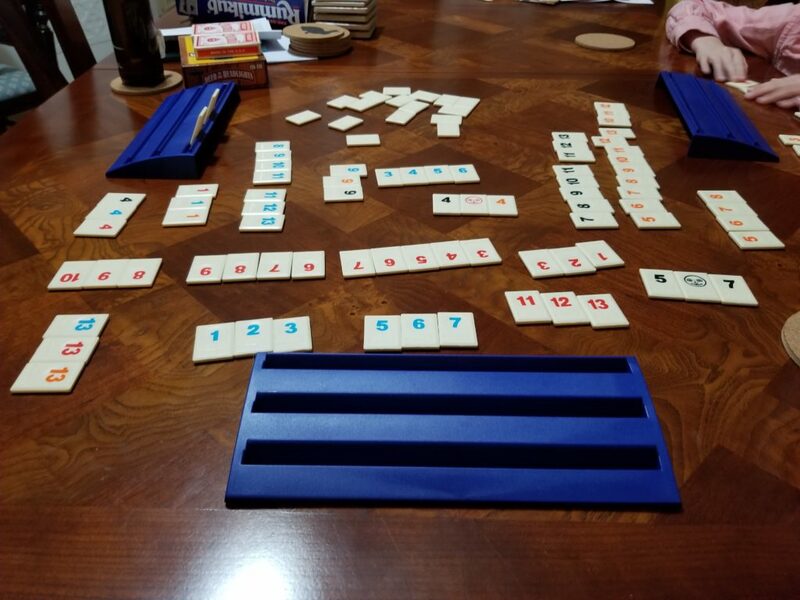 Years later, we still play with their old Tournament Rummikub set. Several years ago I acquired a Rummikub set of my own. My son is around the same age I was when I learned how to play while watching my grandpa. My wife and I decided we would teach him how to play during our weekly family game night. 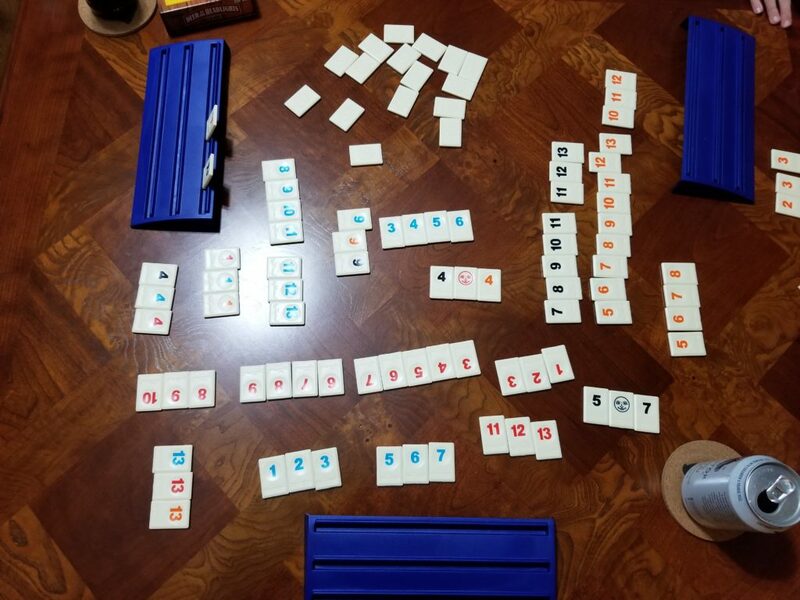 Rummikub is a tile-based game designed by Ephraim Hertzano. The set I currently have was published by Pressman in 1998. Rummikub may be played by two to four players. My hand at the beginning of the game. One thing I discovered rather quickly is that the rules provided with my Pressman set are in many ways different from those from my grandparent’s set. I looked up Rummikub on Wikipedia and found that Hertzano authored a book entitled The Official Rummikub Book in which he provides three versions of the game: American, Sabra, and International. According to the article, the 1998 Pressman edition is the Sabra version. To set up the game players dump all of the tiles face down in the center of the table and mix them all up. Then each player draws 14 tiles to make up their hand. The objective is to create sets of three or more tiles. A set should contain all of the same number with different colors, or be a run of numbers in sequence with the same color. There are 106 tiles total. This includes tiles 1-13 of each color blue, black, red, and orange twice, along with two jokers. The same game can also be played with two decks of standard playing cards where two jokers are thrown out. In order for a player to make their first play into the center of the table, they must be able to play a number of tiles that equals 30 or more points all at once. Jokers are wild tiles that may represent any other tile in the game. When played in the initial play their point value is the same as the point value of whatever tile they are replacing. I’m out of tiles. I win! The first initial play may only consist of tiles from the players hand and may not be played on any other player’s tiles. Each turn after the initial play, a player may play on any set in the center of the table. Tile sets may be added to, split, substituted, and combined in interesting ways to eliminate tiles from the player’s hand. Most everything is fair game, though players will want to brush up on the rules to make sure a move they are making is legal. Also if you’re making a complicated move, make sure you know how to back out of it if you get stuck and it doesn’t work. Otherwise the other players will hate you. The 1998 Pressman rules have a good template that may be used to determine a move’s legality. The most crucial rule to remember when playing on the center tiles is that to substitute and reuse a joker, the tile it is being substituted must come from the player’s own hand and not from somewhere else on the board. All tiles that have been played to the center must stay in the center. A player can’t substitute for a joker and then keep that joker in their hand for a later turn. The first player to successfully play all of their tiles into the center wins the round. In the event where no player is able to play all of their tiles, the player with the fewest and lowest scoring tiles is declared the winner of the round. Jokers remaining in a player’s hand are scored as 30 points. All other tiles are scored at face value. The final state of the game. The winner receives a positive score for the round that is the sum total of all the points left in each other player’s hand. The non-winning players must then receive a negative score equal to the number of points remaining in their hand. According to the 1998 Pressman rules, the players must agree on the number of rounds or the total number of points to play to in order to determine when the game ends. Whomever has the highest number of points at that agreed upon milestone wins the game. 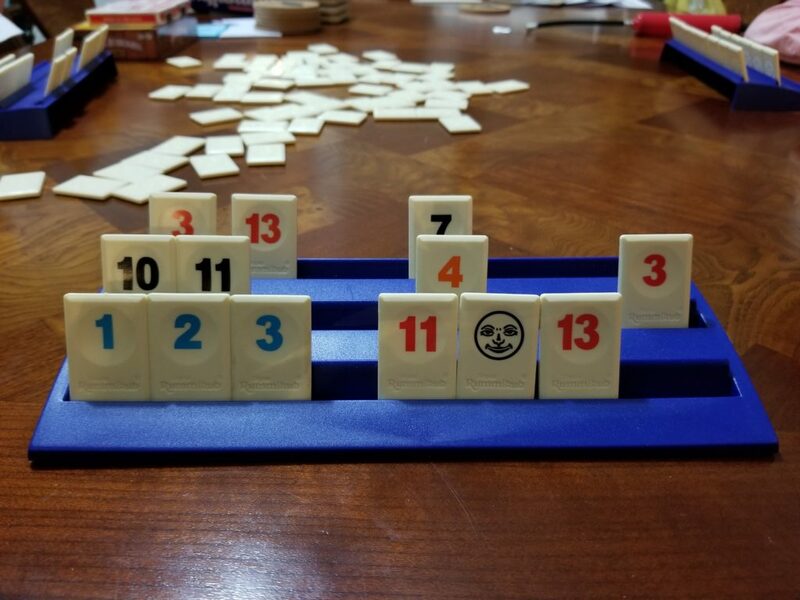 The Rummikub family rules I played with growing up required 50 points for the initial play and had some heavier restrictions regarding under what conditions a set with a joker could be altered. This 1998 Pressman Sabra version feels really easy by comparison. The next time I visit my grandmother I will look at the rules they had and see if I can compare the two. It has been some time since you saw your uncle Fred. He is the adventuring type, and once again he has gone off on an adventure, but this time for longer than usual. Because you are curious, you sneak into his house and see if you can find clues about where he’s gone. While there you find an adventure suit, just like the one he takes with him on all his adventures, but this is a special one sized just for you. You try it on and play with the contraptions you find in his observatory. You find an interesting switch and flick it on. The dome of the observatory opens and you find yourself slingshotted out into the stars. The Adventure Suit is waiting. 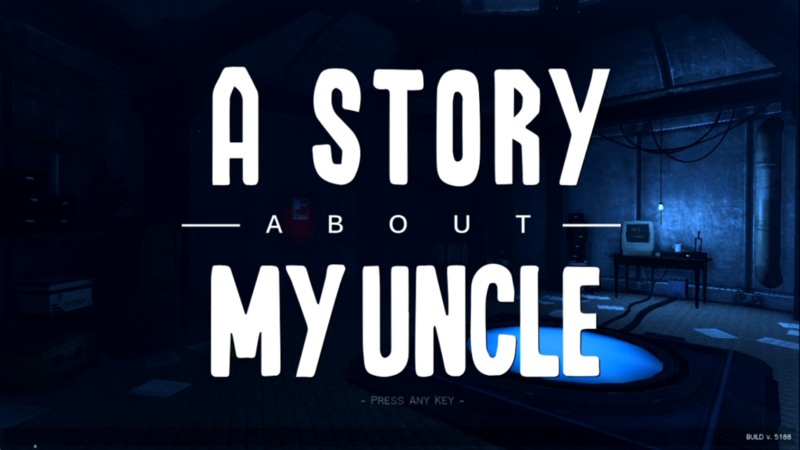 A Story About My Uncle is a first person action adventure game. It was developed by Gone North Games and published by Coffee Stain Studios. It was released in 2014. I have seen reviews say A Story About My Uncle is a parkour simulator, but I think that is selling it short given its rich story that I’ll get to in a moment. The player can run and jump by holding down the shift key or hitting the space bar key respectively. 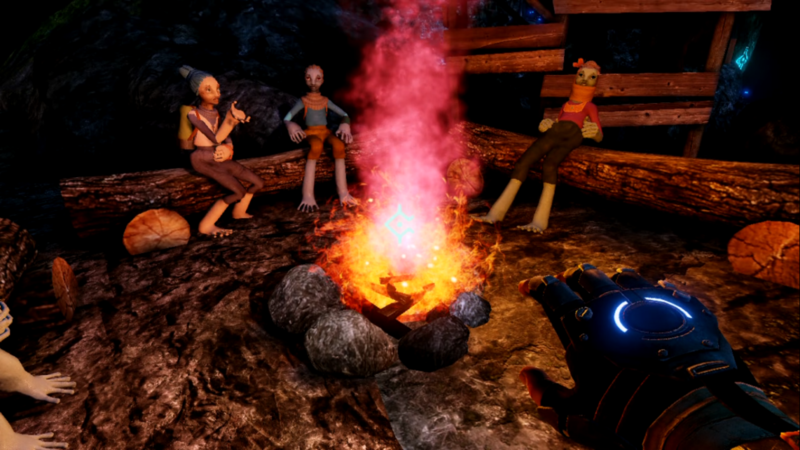 The player’s adventure suit can do much more, such as an increased jump when holding down on the right mouse button. This is what a save beacon looks like. The suit also has a powered grappling hook that can be used as a tractor beam to pull the player toward an object that is relatively close to their current position. Those who have used the grappling hook in Team Fortress mods or other first person shooters will likely understand the mechanic. If you haven’t, just think Spiderman. 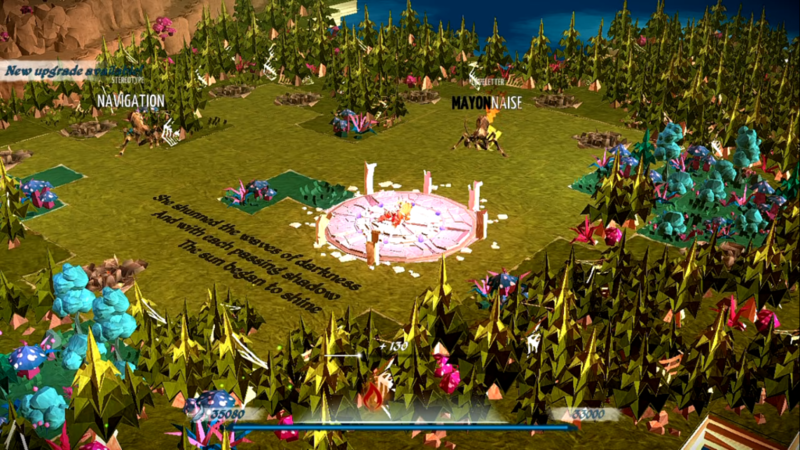 An obstacle course of floating islands is provided for the player to cut their teeth on in their quest to finding their uncle Fred. It was great fun jumping from platform to platform in the strange jungle cave. I am typically afraid of heights, and I struggled with that fear when first playing A Story About My Uncle. But the game is very forgiving. Your suit will protect you from all falls. The only thing dangerous concerning falling is falling into liquid since the suit is apparently too heavy to float. 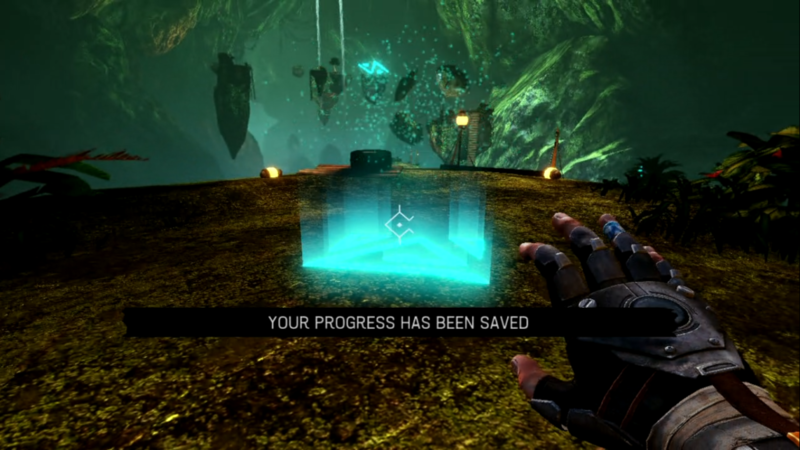 At least at the beginning of the game there are quick save beacons on nearly every surface. 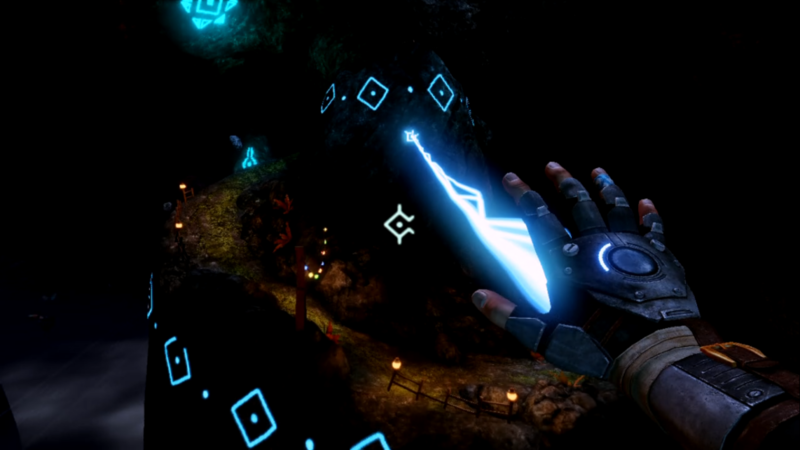 Just get in close proximity to one of these brightly lit beacons and your game will quick save. It’s easy to start over whenever you fail. In no time you’ll be able to bound around the game world handily enough to keep up with the story. I had originally thought based on the vast empty world and the quiet and secluded ambiance that A Story About My Uncle would be a game in which I would find myself alone. The same adventure formulas used by classic adventures like the Myst and The Journeyman Project series seemed to be in play here. Nice to meet you, Maddie. I was playing in a dark room late at night with headphones on and out of no where I heard a voice say, “Hello, who are you? You’re not from here.” I just about jumped out of my seat. But as it turned out this friendly voice appeared to be attached to a friendly creature who knew my Uncle Fred. Maddie was her name and she gave me a tour around her village once I got there. After her quick tour she went on ahead to talk to the village elder, Samuel, for me while I went to take a look around the village and Uncle Fred’s tent. 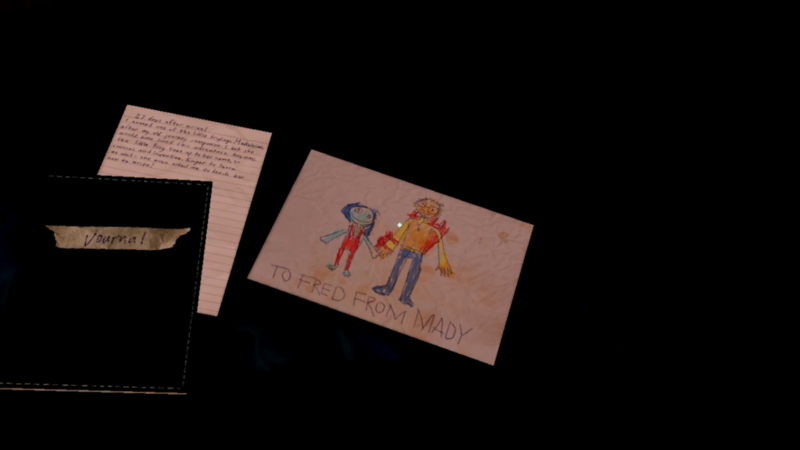 There in the tent I saw that Maddie had drawn a picture for Uncle Fred. After finishing looking around the village I am supposed to meet Maddie and elder Samuel at his dwelling. At this point I’m not sure what to expect next from A Story About My Uncle. It is following the predictable formulas I have come to expect from good adventure games while simultaneously throwing me quite a few curve balls thus far. The characters I have encountered seem charming and it feels so good to be swinging like Spiderman through a world of peaceful amphibious creatures. However there has to be some dark mysterious conflict somewhere. The story would not ultimately be compelling without it. Thus far the story telling has been too rich and the tension is building too great for there not to be some impending drama. The player’s character is narrating in the future as a bedtime story to his daughter, so perhaps the story won’t get too out of hand. I’m really excited to see where it goes. In real life, I got sick with some kind of winter crud. Whenever this happens I usually pick out a simple turn-based Japanese role-playing game with a heavy but linear plot that I can mindlessly mash buttons to. It was refreshing to pick up A Story About My Uncle as it gave me the perfect mixture of fun non-complex action with a heavy dose of engaging story. I’m looking forward to reviewing this one once I have completed it soon. It would be great if there were some grappling hook universe out there I could escape to just to play video games in. 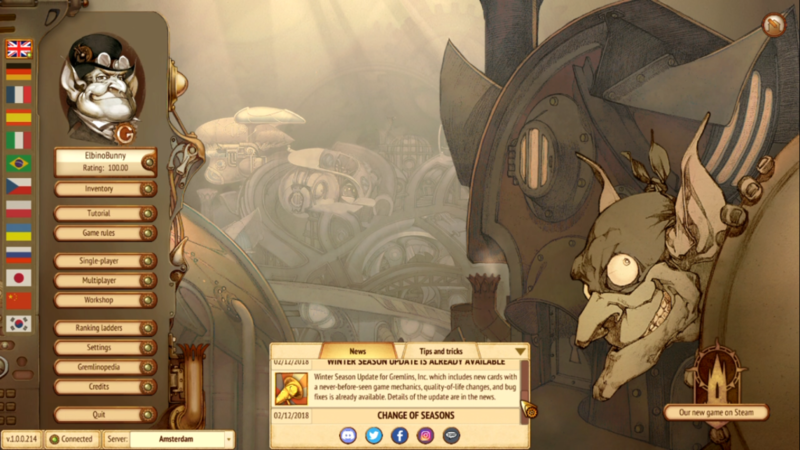 Epistory: Typing Chronicles is a hack and slash role-playing typing (yes, role-playing and typing) game released in 2016. Epistory was developed by Fishing Cactus and published on the Steam platform by Plug In Digital. It was also published DRM free to Humble Bundle and is featured in their Humble Bundle Trove for Humble Bundle Monthly subscribers. Excited about starting a new engaging adventure, I browsed through a list of games I had not yet played and saw the title Epistory. 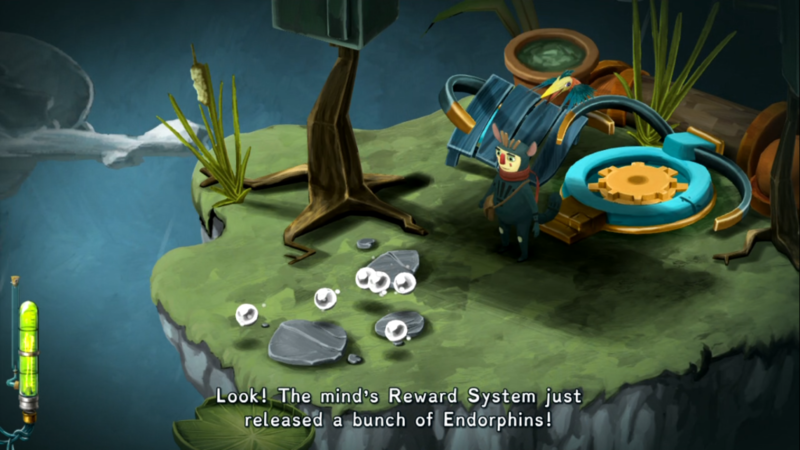 I loaded up the game and saw the complete title, Epistory: Typing Chronicles. I resolved to give it a chance and started the game. The game begins with narration. Once upon a time. It was the best of times, it was the worst of times. My head was in my hands. They took a line from a classic Charles Dickens novel without directly alluding to the meaning of that line in its context. This is going to be painful. There was a girl. And she rode on the back of a great fox. Ok, that’s better, could we have just started the story with that? Please tell me more. Don’t tell me what to do. I’ll use the W, A, S, D keys if I want. Epistory begins with a young blonde girl mounted on a very red fox. It is recommended from the start to use the E, F, J, I keys for movement in lieu of the W, A, S, D keys typically used for movement in most PC games since they are closer to the center of the keyboard for quicker typing speed. I spent over an hour trying to get used to navigating with the E, F, J, and I keys. My biggest issue was that while the E, F, J, and I keys are recommended, the W, A, S, D keys are still mapped, so accidentally touching the D key (which is beneath the E key) sends you in the wrong direction. When I finally switched back to using W, A, S, and D for all of my movement, Epistory became so much easier to play, so I recommend using W, A, S, and D from the beginning. 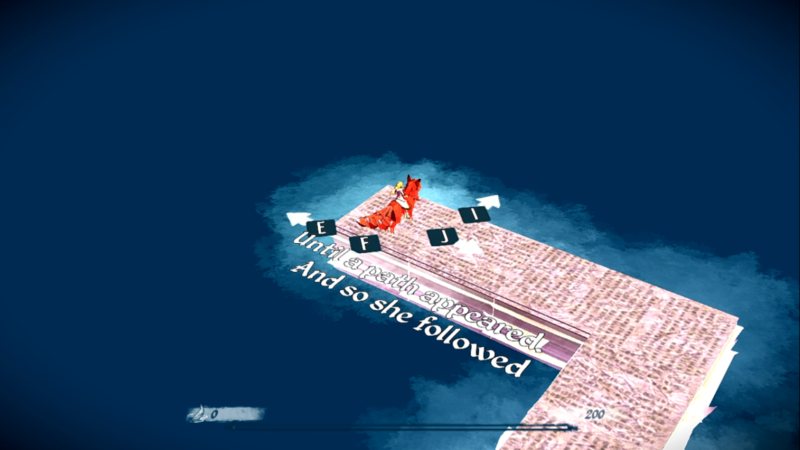 Therefore, using the W, A, S, and D keys, the player navigates through the world as the story is told. Despite the rocky start, things only got better and more impressive from there. Epistory feels like any other role-playing game where you’re navigating through and exploring a fascinating, colorful world. 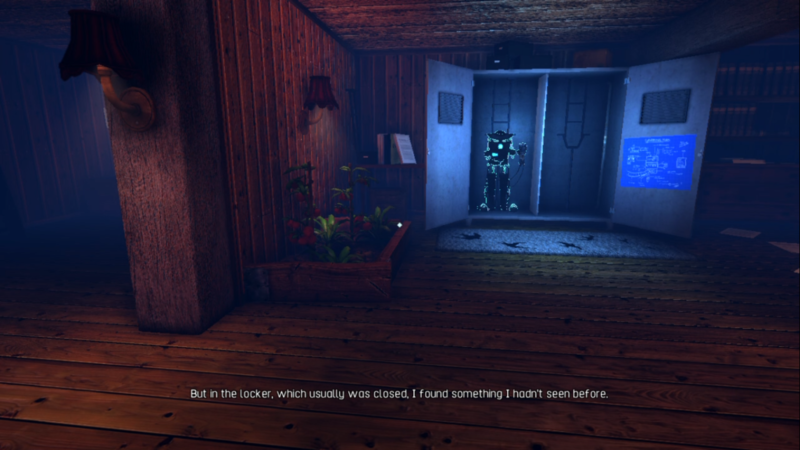 When an obstacle is encountered, the player must type out a word to remove it. Whenever a word is typed, the player receives experience points. 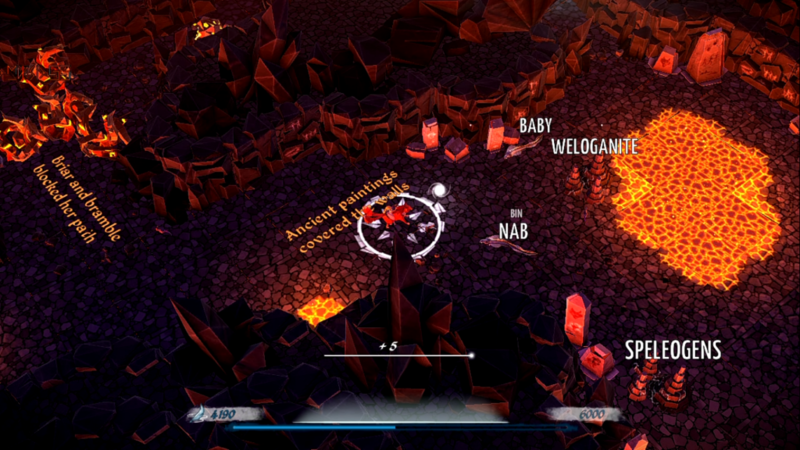 Chaining words in rapid succession, the player can score combos to get a greater number of experience points. 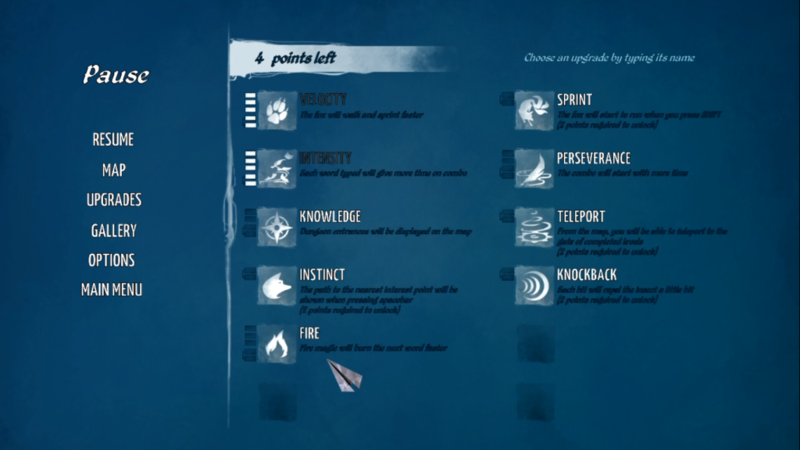 Once experience points have been sufficiently accumulated, the player levels up and can choose how to spend skill points to unlock new player skills. You will encounter real enemies on your quest with real words. Large words. Pressing the space bar will show the player all of the words in their immediate area they can type for points. Whenever a word is successfully typed, a magic bolt is fired by the girl and her fox at the object that had the word. As the game progresses enemies will approach the player and can be defeated by successfully typing words to eliminate the deadly creatures. Epistory reminds me of Diablo. One direct hit from a creature will kill the player, and Epistory does not start at the lowest vocabulary like other typing games do. The words employed have meaning in relation to their objects. All are real dictionary words and rarely repeated as the game progresses, keeping play fresh. This is not Mavis Beacon Teaches Typing or Mario Teaches Typing. No one is going to help you find home row in this world where evil roams. Playing Epistory is more like playing Diablo as a Ranger class, but instead of clicking the mouse button to shoot your bow, you are typing to do so. I am a software developer by trade and have been told I am an excellent typist, and I still find Epistory to be challenging. This is a good title for adults and those who feel their typing skills are up to the task. Puzzles are well integrated and increase in difficulty. Epistory is now on my shortlist of games I hope to complete in the near future because I want to see what happens next. It has thus far done a phenomenal job striking a balance between challenge and fun to compel me into wanting to continue to play. 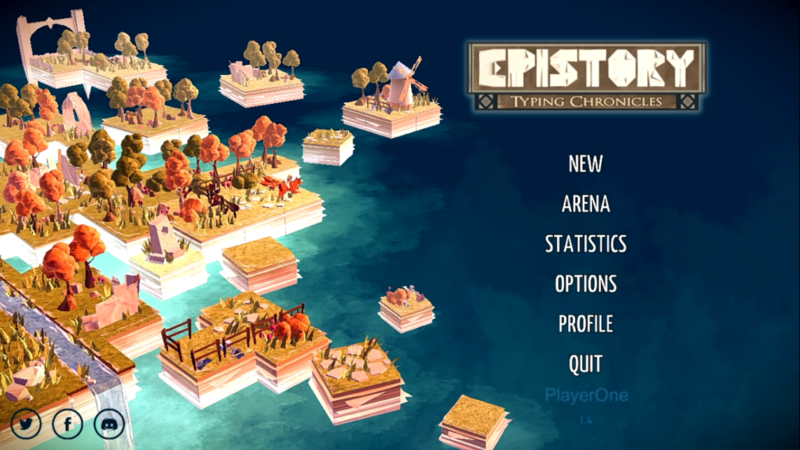 I don’t recall ever having played an edutainment title as enjoyable as Epistory: Typing Chronicles.